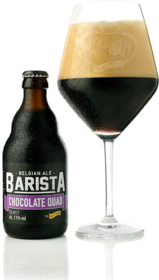 Barista Chocolate Quad is a Belgian beer, it has an alcohol content of 11%. The name ‘Barista’ conjures thoughts of the fragrance of steaming coffee below a layer of expertly created froth. This may sounds rather far-fetched for a beer… However, the aromas and the flavours of caramel, cacao and roast malt match seamlessly with the ‘black gold’ and chocolate. This beer builds bridges with the world of hot beverages, with warming alcohol in the finish. One to enjoy all the year round: with a meal, in front of an open fire or on an outdoor terrace. Great beer, quite unique coffee/chocolate taste.